06.19.07 First chess, then basketball now it's baseball. Deer Isle-Stonington kept the steamroller going with a win at the Class D baseball state championship in Standish on Saturday, June 16, 2007. The Mariners, who fielded eight seniors many of whom are chessplayers, took care of Rangeley 11-2. Here's Pete Warner's Bangor Daily News article. STANDISH ’Äî Bryant Ciomei and the rest of the Deer Isle-Stonington baseball team awoke bright and early Saturday for the three-plus-hour bus trip to Saint Joseph’Äôs College. With the Class D baseball state championship game scheduled for noon, the 6 a.m. wakeup call wasn’Äôt a problem for senior co-captain Ciomei and most of the Mariners. "When you get up at 3:30 [a.m.] to get on the boat every morning, it’Äôs not really a big deal for me," said Ciomei, a fourth-generation lobsterman who recently bought his own boat. The Mariners, about half of whom are fishermen, headed home to the coast Saturday evening with a prize catch ’Äî their second state championship trophy in three years. Collin Ciomei and Ray Garcia combined on a four-hitter and were backed by a 10-hit attack as Deer Isle-Stonington beat Western Maine titlist Rangeley 11-2 at sunny Mahaney Diamond. It was the second state championship of the year for the Mariners (17-2), who also claimed the Class D basketball crown. They took advantage of their big-game experience. "These guys were tournament-tested," said coach Darren Eaton. "This was expected. These kids would take nothing less. And that’Äôs what they did in basketball." Buoyed by a group of eight seniors, Deer Isle-Stonington played with the kind of confidence that can only come from being exposed to such situations. "Experience-wise, we knew what to expect and we knew how to perform under the pressure. 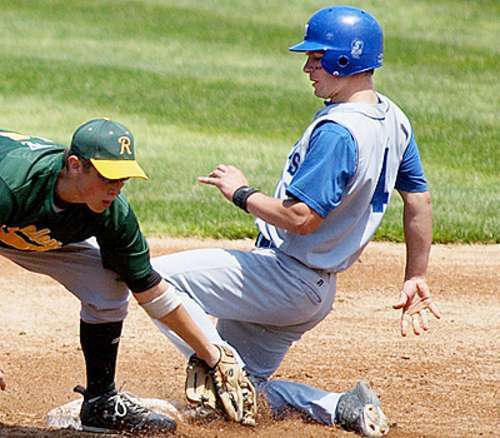 It makes it a lot easier," said junior Collin Ciomei, who allowed only three hits and two runs in 5¬§ innings. The lanky righthander, who struck out six, walked two and hit a batter, had pitched the Mariners to victory two years ago as a freshman. "We’Äôve been fortunate to be here in the past couple years and the feeling’Äôs awesome," he added. Older brother Bryant Ciomei, who singled twice and scored two runs, was pleased to end his high school career with a victory. "I’Äôm glad we went out on top," said the two-time state chess champion. "I finished my senior year real good ’Äî two state championships. I couldn’Äôt be any more happy." A youthful Rangeley (12-5) ballclub was unable to get much going offensively. The Lakers committed four errors, while their pitchers issued four walks and hit four batters. The Mariners seized the momentum from the outset as Collin Ciomei led off the game with a single and Bryant Ciomei was hit by a pitch with one out. Senior Jon Eaton looped an RBI single to left and moved up on the throw to third base. Senior Shane Eaton produced the second run with a groundout to shortstop. "That first inning we came in swinging the bats, because we were the away team," Jon Eaton said. "We like to try to do that, get up early. That takes a lot of pressure off our pitcher and our fielders." While DI-S didn’Äôt make a lot of great contact in the first three innings against Rangeley lefthander Luke Hammond (the Mariners hadn’Äôt faced a lefty all season), the Eastern Maine champs caught up to him in the fourth. Ben Hardie drew a leadoff walk and Eben Powers fisted a one-out single to right. Collin Ciomei followed with a hard RBI double to left-center and a second run scored when the ball scooted by the center fielder. Ciomei scored when a passed ball led to a throwing error by the catcher after he retrieved the ball. Rob Brown walked, then Bryant Ciomei singled to left and moved up on the throw to third. Jon Eaton made it 6-0 with a run-scoring single over the shortstop. "The last two or three games we put up some really big hits, and at key times," coach Eaton said. Collin Ciomei led DI-S with a double, two singles an RBI and three runs scored. Jon Eaton added two singles and two RBIs. Ryan Gordon paced Rangeley with two singles while Kent Madeira added an RBI single. Bryant Ciomei, younger brother Collin, and the rest of the Mariners were able to sleep in and enjoy their victory as lobster fishing is prohibited on Sundays. Wow! Congratulations to Collin and Bryant and all the other DI-S players!